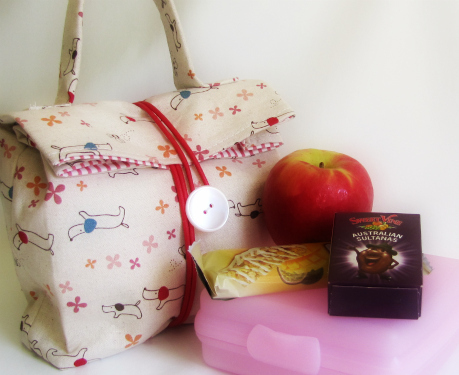 Your little one will the talk of lunch with these adorable fabric lunch box bags. The kit includes fabric, cording with the designer adding some very simple instructions on making the bags at no cost. You will need to provide some iron on interfacing (lightweft or wisperweft) button and template plastic (which I didn't use in the sample above) which are not included in the kit. This is the sample I made up. The Japanese linen & cotton lining fabric were beautiful to work with and it went together like a dream. The size is deceiving as they look quite small. They comfortably held a tupperware lunch bag, apple & a couple of snacks. I also had enough fabric left over that I could of made a little wallet to hold lunch money in. Or you could maybe add an inch or 2 to the width or length. I didn't use template plastic for the base but used a heavier interfacing. If you have any queries at all please contact me. This Friday Special is for 7th October, 2011 only - limited stock. Enter the code LUNCH at checkout for this great discount.